The WaPo has a gorgeous photo essay on Artomatic... check it out online here. "The 2012 iteration of Artomatic is the largest to date, with more than 1,100 artists participating. That number will increase with each day of the monthly installation. The sixth floor of the building will be an "Art Reactor," a space where visitors will be able to create their own art with supplies provided by the space." Read the whole piece on the HuffPost here. "Walk through Artomatic for two hours and the effect is what you might expect: It's dizzying. Draining. Eleven floors, 10 of them busting with artworks from 1,300 contributors. Some floors are labyrinthine; others are wide-open displays of sculpture and installation, interrupted by a stage and bank of chairs. 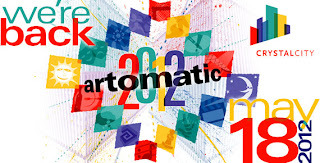 Like the last time Artomatic was in Crystal City, this year's show is housed in an old office building. The carpet looks cheap; the drop ceiling feels cheaper. The lighting is mostly fluorescent. It is everything a museum or a gallery shouldn't be. And that's the point, because it is neither. Consider what it is: a six-week event by local artists for local artists, run almost entirely by volunteers in a vacant building. There are the stages: poetry on the 11th floor; Heineken (one of the sponsors) has stages on the 10th and eighth floors; the ninth floor has a dance stage. If it isn't the largest volunteer-run arts organization in the country, it's probably near the top"
Read the whole article in the WCP here. AOM: The biggest art party of the year is tonight! The show that both right-wing neocon and left-wing nuts art critics love to hate and that all other art lovers embrace and love opens tonight! Do not miss the art opening party of the year, and in the DC Art News AOM tradition, I will be publishing anyone and everyone's Top 10 List! Send me your list of your top ten AOM artists and I will publish all of them throughout the duration of this art-battery charging event.